It’s early March and a fresh blanket of snow reveals the scurry of rodents and the trudge of moose in the forest. The moment is serene and tranquil—nearby sounds are of the sway of aspen trees and the flaps of intermittent flocks of Snow Buntings flying overhead. A closer listen, however, reveals hums and whirs in the distance emanating not from the forest, but from a human source. A passing truck, a compressor fan, a digging backhoe: all these sounds transform the forest into a complex acoustic landscape. 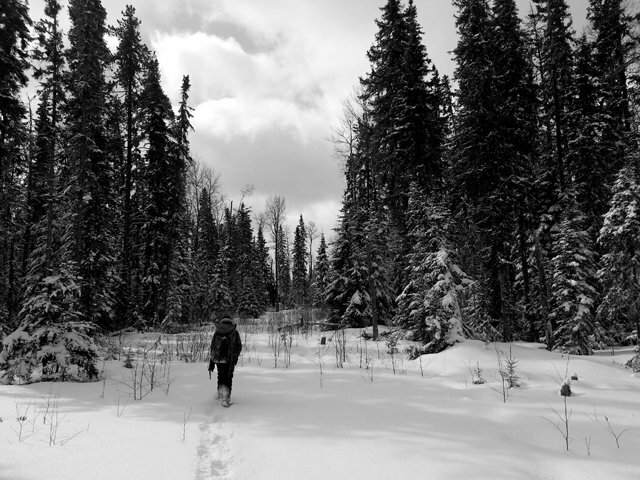 A University of Alberta technician completing owl surveys on a wintery day. Photo(c) Alex MacPhail. 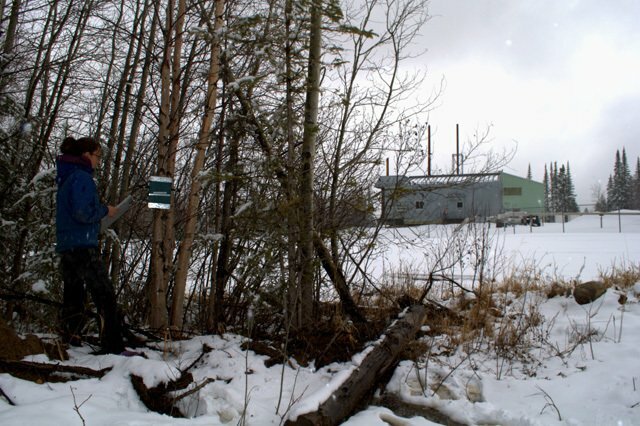 The rapid increase in industrial activity in the boreal forest in northeastern Alberta is simultaneously resulting in a rise in industrial noise. 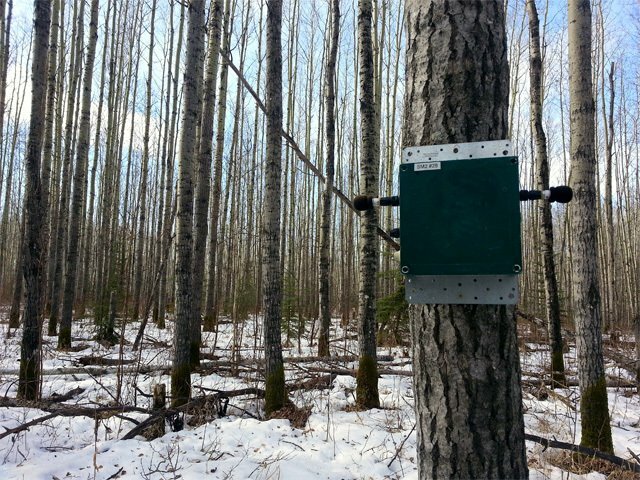 The questions of how the sheer increase in the magnitude of noise, as well as the debut of new sounds in the boreal soundscape, are affecting the behaviour of wildlife residents—particularly rare and elusive species, such as owls—in the area have recently emerged. An important first step in addressing these types of questions is to develop and implement protocols to monitor rare and elusive species, and then examine the effect that industrial noise has on them. Since 2012, the ABMI and the University of Alberta have been doing just that. Since the ABMI’s core monitoring program tracks changes in groups of common plants and animals, and doesn’t always capture sufficient data on rare and elusive species, the Rare Animal Monitoring Program was created to address this gap. 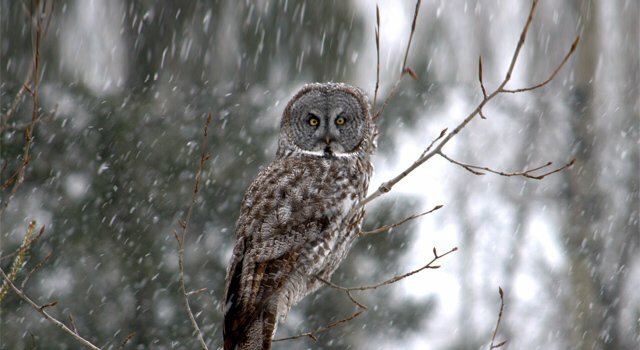 A major part of program is directed at broadening the knowledge of the resident and migrant owl species that occupy the region, such as Boreal and Great Gray Owls, with the recent focus of the work examining the impact of industrial noise. Fieldwork for the owl component of the program runs from March until May, during the breeding season when they are the most vocal. Fieldwork is coordinated by the ABMI, but the heavy lifting is done by graduate students and technicians led by Dr. Erin Bayne at the University of Alberta. Data collection begins by deploying inconspicuous little green boxes known as acoustic recording units, or ARUs in specified locations. These devices are weatherproof and programmable to record at various intervals throughout the day to capture the calling behaviour of targeted species. In the case of owls, they’re activated at night when owls are most vocal, which eliminates the need for human observers to be out in the forest on cold winter nights. Deployment takes no more than a couple minutes, but will contains hundreds of hours of acoustic data after three months in the field. To get at the how industrial noise might be affecting owls, the ARUs are placed in grids near industrial features that have different noise levels such as compressors, wellpads, pipelines and transmission lines. Despite the quick installation, unpredictable spring weather and snow conditions often make accessing the grids a significant challenge. When one of these beautiful creatures makes a sudden and unexpected appearance on a tree branch, however, the effort is fully rewarded. After the field season, the owl data is collected from the ARUs and returned to the University of Alberta, where crews get cozy and spend time organizing the recordings. They look for the unique spectrograph signatures of the seven species of owls like the ringing hoots of the Northern Saw-whet Owl or the frenzied cackling of a Barred Owl. Research is also currently underway to developing automated computer recognizers that would analyze the acoustic data significantly faster. Now, as the days lengthen and the snowpack begins to fade, the 2014 owling season is drawing to a close. The once homogenously white forest is beginning to reveal greens and browns as foliage returns to the forest’s understory and sleepy deciduous trees. The ARUs are being moved from owl habitats to wetlands to begin their summer duty of collecting data on amphibian and marsh birds, the study of which makes up another core component of the Rare Animal Monitoring Program. Stay tuned for updates!